+ My camera ate my pictures - can you help? The key thing to do is to do nothing. 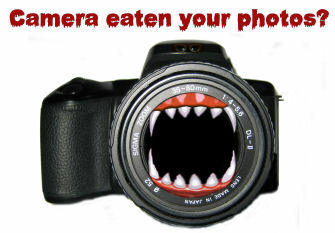 Do not use the camera, just take the camera card out and put it somewhere safe. It is really important because if you continue to use the card the images (or video) that you have lost may not be recoverable. BUT if you don't use the card after the images are lost, there is a good chance we can get them back. Now that's good news isn't it? + I deleted an important picture (or video) - can you get it back? Deleting an image or video does not totally destroy it. They can be recovered. + I formatted my camera card - is it all gone forever? Even formatting your camera card does not totally destroy the images or video on it. They can be recovered. + My hard-disk camera lost my pictures - is it the end? Take heart - there is hope! The key thing to do is to do nothing. Do not use the camera. Switch it off and do not use it until we have had a look at it. It is really important because if you continue to use camera then the images (or video) that you have lost may not be recoverable. BUT if you don't use it after the images are lost, there is a good chance we can get them back. Now that's good news isn't it? + Why don't you look at my recovered images or videos? When we recover images or video from your camera card (or hard disk) we restore everything. Everything including images you may have deleted. Images that you might prefer no-one to see. To protect your privacy (and because we don't necessarily want to see those inconvenient snaps of you in the bath) we do not look at the files we restore. + Why are some of my restored pictures only half pictures? When images are recovered from camera cards (or hard disks) there is a chance that part of the files could have been overwritten by the camera. Because of this some images may actually only be part of the original image. + Why are there many copies of the same recovered videos? When video is written to camera cards (or hard drives) they are not always written in one single go. It is quite possible for the actual video to exist on multiple parts of the card (or disk) which are then copied to other parts of the card. Confused? Don't blame you. But it happens. So it is possible that there could be many copies of a restored video.